So ten years ago, a horrible, horrible young adult book was published. It took everything you thought you knew about vampires and turned that on its head. It threw in werewolves and a horrible, hard-to-like heroine for good measure. It romanticized controlling, stalkery, creepy behaviour and reinforced for teenage girls everywhere that those were the kind of traits you should look for in a boyfriend. And we haven’t even gotten to how horribly written it was. In celebration of this young adult phenomenon, Snark Squad will be recapping Twilight, the first book of The Twilight Saga by Stephanie Meyer during the month of October! We’re going all out Twilight with Twilight-themed vlogs, Snarkathon and even a giveaway or two. Join me, Mari, Catherine and Kirsti as we recap Twilight. Starting tomorrow, head on over to the Snark Squad website for all the sparkly vampires you can handle. Welcome to our own personal hell. 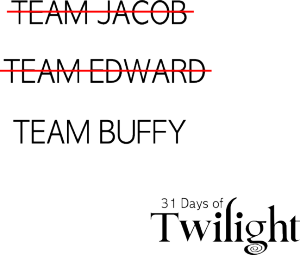 Hashtag 31DaysofTwilight, yo.